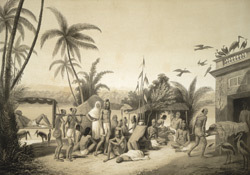 Lithograph of the sick being brought to the banks of the Ganges near Calcutta by L.H. de Rudder (1807-1881) after an original drawing of 1842 by Prince Aleksandr Mikhailovich Saltuikov and published in Paris in 1848. Hindus regard the River Ganges as amrita, the elixir of life, which brings purity to the living and salvation to the dead. Those who die on the banks of the Ganges are considered extremely fortunate and blessed. This is because they attain release from samsara, the unceasing cycle of death and rebirth, and are assured of moksha or enlightenment. The dead person’s family bring the body down from the city on a bamboo stretcher covered in a red or white cloth while chanting and praying. The body is dipped into the Ganges and put on a funeral pyre lit by the eldest son or a close relative from an eternal flame which is kept burning on the ghat. The ashes are later scattered onto the river.